It may be difficult for younger readers to believe, but I grew up in a time when Steven Spielberg was the master of imagination. A new Spielberg film was greeted with great anticipation, as we knew that the movie would transport us to a new place or show us something that we'd never seen before. But, during the mid-80s, Spielberg began to turn his attention towards more serious fare. This appeared to become an obsession with him in the 90s, and if you were to ask me what his last fantasy movie was, my answer would be Jurassic Park. But, in actuality, he's made 7 sci-fi movies since that time...but none of them can be considered classics. Has Spielberg lost his ability to wow audiences? The answer to that question may life in Ready Player One. The year is 2045 and most people spend their time in The Oasis, a virtual-reality world where individuals can live through their avatars and have multiple adventures. In the real world, many live in poverty, with some working as pawns for the massive company Innovative Online Industries. Wade (Tye Sheridan) lives in the "stacks" in Columbus, Ohio, and stays in the Oasis as much as possible, as "Parzival", where he competes in various events, scavenging for credits. Like many participants, Wade is attempting to solve a series of puzzles left behind by Halliday (Mark Rylance), the co-creator of The Oasis. The player who solves the puzzle will take control of The Oasis and immediately become rich. Nolan Sorrento (Ben Mendelsohn), the CEO of IOI, also has his sights on this prize and he'll stop at nothing to get it. Wade must work with his VR friends to beat Sorrento to the ultimate goal. Ready Player One is based on the 2011 novel by Ernest Cline, which I have not read. The book become very popular due to the fact that it is loaded with pop-culture references. It was because of all of the licensed characters and products mentioned in the book that it was considered unfilmable. But, apparently if anyone could crack the code, it would be Spielberg. Again, I have not read the book, but after scanning a synopsis of the novel, I can tell you that A LOT was changed for the film. Does that make a difference? I don't know, but let's dive into the movie as it is. For all of its intended complexities, Ready Player One has a very simply story, as it's basically Charlie and the Chocolate Factory meets The Matrix. The basic premise is practically lifted directly from Roald Dahl's classic story, as we have a poor boy who may be able to inherit a grand business from a reclusive genius if he can survive a series of challenges. Things are a bit more complex than that, as Wade must research Halliday's life and solve riddles as well as completing tasks, but still, the rudimentary pieces are the same. The Matrix comes in as we have a story where the characters lives inside virtual reality is much different from their real lives. This is a major part of the film throughout, but it really hits home in the scene where IOI thugs are attempting to find Wade in the real-world so that they can shut down Parzival in The Oasis. I couldn't stop thinking about The Matrix during this sequence. That lack of originality does hurt the film, but Ready Player One still has some things going for it. While the pop-culture references and characters may vary wildly from those which are in the book, the movie still offers a great deal of fun as astute viewers will try to spot as many as possible. While some are front-and-center on the screen, others appear for only a second or are part of the background. The pop-culture center-piece of the Ready Player One is a journey inside of a movie which, again, deviates from the movie featured in the novel. The movie itself is an odd choice, as it's a horror movie from 1980 and some younger viewers may have no idea what's going on, but those familiar with the movie in question will appreciate the detail which goes into this sequence. Overall, the arc of the story is rather predictable, but it's well-paced and Spielberg does make us feel for the characters, even with them being stereotypes. With a reported budget of $175 million and a domestic gross of $137 million, it's not a grandiose statement to say that Ready Player One underperformed. This may have been due to poor word-of-mouth from fans of the book who were appalled by what they were seeing on-screen. This also could have had something to do with the marketing, as the overall premise of the movie was somewhat muddled in the trailers. They should have been honest and simply stated, "It's Charlie and the Chocolate Factory meets The Matrix." And they could have also added, "And you'll have a blast spotting all of the pop-culture references!" Ready Player One is flawed, and it certainly doesn't rank as a Spielberg classic, but it shows that he still has a firm grip on storytelling, even if said story isn't very original. Ready Player One actually threw Chucky into the mix on 4K UHD courtesy of Warner Bros. Home Entertainment. The film has been letterboxed at 2.35:1 and the Disc contains an HEVC 2160p transfer which runs at an average of 75 Mbps. The image is very sharp and clear, showing no grain and no defects from the source material. The picture has a notable crispness, which benefits both worlds in the film. The real-world scenes have a notable clarity, while the Oasis sequences deliver a nearly 3D look. The colors look good and the image is never overly dark or bright. The level of detail allows us to see textures on objects. The Disc carries a Dolby Atmos audio track which runs at 48 kHz and an average of 4.5 Mbps. The track provides clear dialogue and sound effects. The action sequences provide very detailed surround and stereo effects, as the mix places us in the middle of the action. The movement of these sounds from speaker-to-speaker is notable. The subwoofer effects deliver strong bass, which adds emphasis to the explosions. 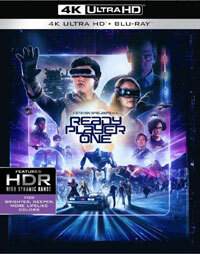 All of the extras for Ready Player One are found on the accompanying Blu-ray Disc. "The '80s: You're the Inspiration" (6 minutes) has Author Ernest Cline, Spielberg and others discussing the influence which the 1980s had on the film and their personal views on the decade. "Game Changer: Cracking the Code" (57 minutes) focuses on the challenges of creating the digital world seen inside the film. We go onto the motion capture set to see Spielberg and the actors at work, while there is also a talk about how to bring all of the pop-culture references to the screen. We get a more detailed look at the creation of the Oasis and the character designs in "Effects for a Brave New World" (25 minutes). "Level Up: Sound for the Future" (8 minutes) look at the importance of sound design in the movie. "High Score: Endgame" (10 minutes) takes us onto the soundstage to see Alan Silvestri conducting the orchestra. "Ernie & Tye's Excellent Adventure" (12 minutes) has the author and the actor talking about key components of the film.